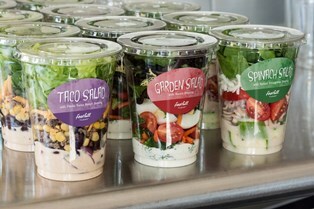 Foothill Farms has developed a Smart Snacks concept - grab and go salad cups - for a la carte and reimbursable meals (when paired with fruit, grain and milk). The concept includes five salad recipes, which meet vegetable, meat and grain requirements, along with cup merchandising artwork that can be downloaded for printing. They are a profitable way for schools to offer salad. Dressing and cheese portions are easily controlled without the waste of a traditional salad bar. The cost per unit is measured and adheres to USDA requirements. The downloadable cup artwork is an easy way to help merchandise the choices for students. The salad cups can be prepared early in the week and held up to 4 days in refrigeration without spoilage. Unused cups can be placed back in refrigeration for use the next day. Each cup meets the Smart Snacks entree caloric, fat and sodium requirements. The DOD (Department of Defense) Produce Program can offset the cost of these cups by utilizing commodity dollars to purchase the vegetables. Packing of this concept includes building the salad upside down with Foothill Farms dressing and the heartier vegetables on the bottom with lettuce and meats toward the top of the cup. This method prevent wilting and spoilage. The salad cup require minimal packaging and are visually appealing.